EN305G M12 5 Port Gigabit Car Industrial Ethernet Switch - EN50155 Railway Ethernet Switch - Shenzhen InMax Technologies Co., Ltd. (InMax) �C the professional supplier of Industrial Ethernet Switches, and provider of IOT Industrial Communication Solutions. Meet the EN50155 railway industry standard requirements. Redundant dual 12/24/48/110VDC power inputs. The EN305G series M12 Gigabit Ethernet switches are designed for industrial applications in harsh environments. The M12 connectors ensure tight, robust connections, and guarantee reliable operation, even for applications that are subject to high vibration and shock. The EN305G series Ethernet switches provide 8 fast Ethernet M12 ports, support IEEE 802.3/802.3u/802/3x standard, 10 / 100/1000M speed adaptive, full duplex / half duplex communication and MDI / MDI-X automatic detection, to provide you with an economical industrial Ethernet solutions. No fan, low power consumption design, working function more steady, and without packet loss in 72 hours full load flow test. It accords with FCC, CE, RoHS standard and industrial design requirement. 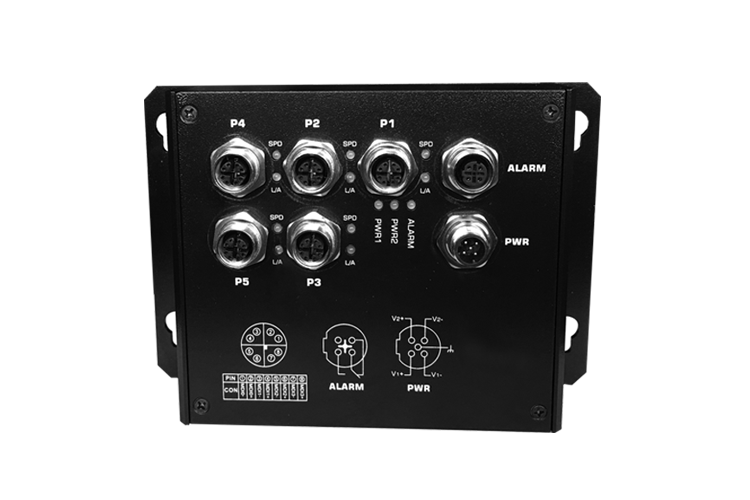 It can work in -40 to 75℃ working temperature and electromagnetic complex harsh working environment steadily, widely used in car PIS, CCTV, car security monitoring, smart factory, and provide reliable and quick solution for customers’ Ethernet device connection.